Hide your desktop from your clients and from the world when recording tutorials or doing screen captures. 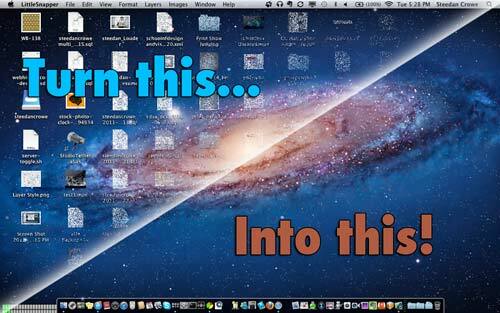 Is your desktop a disaster? Hide your icons from everyone with Camouflage. When I first updated to OSX Lion, I held my breath, hoping my favourite programs would all continue to work. Did the developers upgrade their programs to support Lion? If not, how long until they do, if ever? I was disapointed to find out that Camouflage by Briksoftware was one of the few “Unsupported Apps” on my machine. Odly enough, there were other programs that didn’t work (The Grayed out icon showing instead of the usually colourful version). For some reason not all of these programs were moved into the “Unsupported Apps” folder. Can anyone tell me why? I found this a little tricky at first, it took a little messing around to get things working. If you want the updated version of Camouflage to run on Lion, you’re probably headed straight to the Mac App Store. Installing straight from the App Store seems to purchase a new license for your old version. Whatever happens, it doesn’t work. 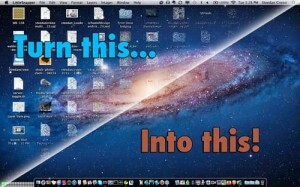 Instead, delete the old version of Camouflage from your Mac. Then go to the App Store, and install the new version. I had the same sad face when I upgraded to Lion. Then came here, then went to the App store. Before I paid the $2 for the app, I just found the old app in the unsupported app file and clicked away. It works fine. Version 1.25. Thanks Roy, Interesting that the old version worked for you. I’m not sure my version number now, but perhaps it was from an earlier revision. I definitely tried running the old app with no luck at all.